Today is special and especially busy. So busy, in fact, that I won’t be able to celebrate. Last year I celebrated five years of freelancing. Today I celebrate five years of FULL-TIME freelance writing. So this is not only my 6-Year Freelance-iversary, it is the 5-year milestone of living full-time as a non-salaried, independent sole proprietor. In a rather fitting twist of events, I will be interviewed today by a college student who is picking the brains of individuals who have the careers she wants. Looking forward to that! Rebecca Gallo. She’s walked the Camino, treats herself to two writing retreats annually, and in recent years has been living a love story. I got to meet Rebecca a few years ago when she was living in Asheville, and now she’s traveling around. She is Renaissance Rebecca. Courtney Gahan. This freelance writer is a citizen of the world. I was fortunate enough to receive a guest post pitch from Courtney a few months ago and you might remember her guest post. She runs the blog Gelati For Breakfast. Sion Dayson. I love writing. I love Paris. How could I not love a blog about a writer in Paris? I learned about Sion a few years ago when poet-friend Pamela Taylor of Poets Double Life met her at Vermont College. She is the force behind paris (im)perfect. Anna Keller. Non-freelance interests brought me to Anna’s blog: A recipe for chocolate chip cookies. I am about as obsessed with food and fitness as I am with writing. Anna’s blog is fun for me because of the food, health, and travel posts—and because she’s in North Carolina too. 🙂 She runs curiouser & curiouser. Hope Clark. Sometimes I feel like a personal salesperson for Hope; I tell every writer I meet about her. Not long ago we had an interview with Hope here. Her fantastic site is Funds For Writers. 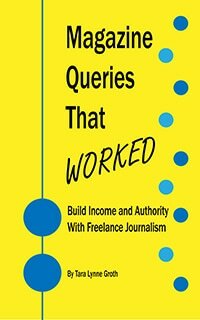 Who are the freelancers you follow? Congrats on your anniversary, and thanks for sharing the posts of others. Now that I’m REjoining the ranks, I’m going to look up the blogs you mentioned. Thx! You will enjoy them. Welcome back. 🙂 Looking forward to our coffee soon! Thanks for the links. I’m already a fan of Hope Clark’s newsletter and blog, and now I’m looking forward to checking out the other writers’ blogs. 1) Anything posted by Modern Day Nomads (I follow them on FB more than anything) http://www.moderndaynomads.com/. They post a lot about writing residencies and jobs for those that want to travel. 2) And the woman who got me started on living a freelance life (after I took her Making a Living Without A Job course via Cambride, MA Adult Ed): Barbara Winter at Joyfully Jobless http://joyfullyjobless.com/blog/. How cool. (Sorry for my belated reply.) The title reminded me of “Gilmore Girls”–except Lorelai hadn’t gotten married–but still intrigued me nonetheless. I checked out her posts and like her style! me too! I’m sorry it’s taken me so long as well. I took a short break from writing during my semester off track.